Longtime Sheldon Fire Co. chief Jerry Meyer died Tuesday, Oct. 2, at his residence. He was 63. Funeral services will be 10 a.m. Saturday, Oct. 6, at St. Paul Lutheran Church in Sheldon. Burial will be at the church cemetery. Visitation will be after 4 p.m. Friday, Oct. 5, with family present 5-7 p.m., at the church. Arrangements are under the direction of Vander Ploeg Funeral Home in Sheldon. Meyer had been battling Stage IV prostate cancer since December. A benefit was held for him at the St. Paul Lutheran Church on May 5. Meyer was a member of the Sheldon Fire Co. for 39 years. 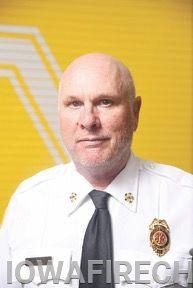 He joined the department in April 1979 and was named fire chief by the Sheldon City Council on March 17, 1999. A Wisconsin native, Meyer came to Sheldon with his family. He is a 1973 Sheldon High School graduate. He and his wife, Kris, have two sons, Paul and Eric. The Sheldon Fire Co. asks that people keep Meyer’s friends and families in their thoughts and prayers during this time. Chief Meyer became a member of the Iowa Fire Chiefs Association when he achieved the rank of Chief in 1999.